Cory: So Myc, we’re back at with The A-Team again. The readers know that we originally intended to make this a full-season venture and simply couldn’t do it. But for starters, we’re right back where we left off, with episode three, “The Children of Jamestown.” This episode is notable for the big cast change, with Dirk Benedict replacing the younger Tim Dunigan as Face. How’d you feel about the move, and what are your thoughts about this episode as a whole? Improvement over the laborious pilot? That being said, I wasn’t impressed with “The Children of Jamestown.” The episode makes some weird leaps. For instance, they rescue the girl, and drive to the helicopter only so most of the team can be left behind and captured? After capturing the team leader of the cult sentences them to death only to give them a head start in an A-Team version of the most dangerous game? And what’s with making them changes shoes? That is clearly added on just so Hannibal can throw out the ridiculous line about his ostrich skin boots. Thus, I’m not so sure that this episode is much of an improvement. It is slightly more watchable than the pilot, and it had some moments, but it is still difficult to trudge through. Cory: Can I tell you something? I actually enjoyed “The Children of Jamestown.” It’s still really, really dumb, broad, and loosely-constructed, but there was a lot more structure and direction in this third episode. The stakes were clear from the beginning, and even though the final few acts devolved into mediocre action sequences, the overall product was more assured. And I think the overall improvement not only comes from the switch from Dunigan to Benedict, but also the episode’s focus on Face as a character. While it’s not as if this one creates this complex character study of Face, Benedict’s better performance in the role makes Face as the center of the show a little bit more believable. Benedict and Melinda Culea have solid chemistry and this episode establishes some of that prototypical will-they-or-won’t-they sexual tension between Face and Amy that was inevitable so they might as well get out of the way anyway. Amy rolls her eyes at Face’s ability to charm any woman, yet they also share a few heart-to-heart conversations about how to survive in The A-Team’s dangerous lifestyle. Again, it’s not great, but it’s something. A start. What did you think of the plot itself? I appreciated that the church posed a tangible threat to the team and captured them pretty early on. Clearly, Hannibal and company were always going to break out, but it was nice to see the show recognize that the guys can’t just drive up, grab somebody and then slink away going like 50 miles an hour and get away with it. Myc: The plot is better in this episode, but I’m not so sure it was that much better. Much more watchable, and an overall improvement, sure; yet, they are still trying to figure out what this show is and who these people are in this episode. I think the cult group’s threats are clumsy, and the cult leader is ridiculous. The best scene is when the team, Face in particular, tries to calm Amy down after they are captured. The way they talk about accepting death as a necessity for doing what they do, while a little hokey, really adds a bit of depth to the characters and almost makes the entire episode worthwhile. Benedict and Culea are great together in that scene. While I can appreciate some aspects of “Children of Jamestown” there are, as I mentioned earlier, just some aspects of the plot I’m not buying. I appreciate that they are caught by the cultists, but they are literally standing next to their helicopter and instead of climbing in and escaping they had H.M. take off with their clients! I mean I guess you could argue that it is a good business choice, but they were free and clear; all they had to do was climb in the helicopter. They had to do more work to get caught and taken captive then they would’ve had to do to get away. Maybe it’s a problem of execution, but their capture lacks any real creative dexterity. Though I guess having them captured so early in the episode is enough of a twist for such an early episode, and they probably needed to establish that the team is capable of dealing with troublesome situations. Moving on though, I seriously can’t get over the forced shoe change. Why would the villains give the team running shoes and a head start before killing them? I guess that’s the only way the episode allows the team to make a jeep-mounted-washing-machine-flamethrower and launch gas-tank rockets, but I would’ve preferred to see them use their skills to actually escape in a more logical fashion. It was impressive to have the guys list off all of the strategic elements of the cult camp after being locked up – but having them display that sort or military acumen only to be let go in a game of cat-and-mouse was disappointing. It would have felt like more of a threat if they had to work their way out of the camp on their own and deal with all of the hostile threats they established existed in the beginning of the scene when they’re imprisoned. I totally get what you’re saying about the cult showing a real threat to the team. I appreciate that this episode established some stakes and consequences and I also like how this episode shows that sometimes a plan doesn’t always come together. Nevertheless, the show is still taking unnecessary shortcuts that hurt the plot. Cory: Random thing: my favorite part of the episode was during the fake fight in the gas station at the beginning. You could totally see the stunt doubles for a good two-three seconds. The 1980s! But those are all good points. My reaction to this episode is likely the result of the re-calibration of expectations I made after watching the pilot. “Children of Jamestown” is an improvement. That’s faint praise, but praise nonetheless. 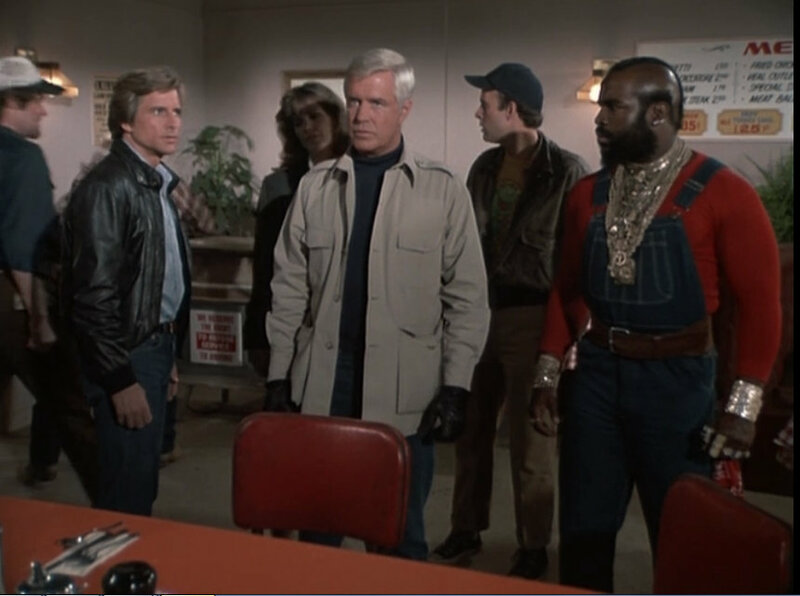 But let’s skip ahead to the season finale, “A Nice Place to Visit.” The first thing I actually want to talk about before getting into the episode is the A-Team’s van. It’s one of the most iconic vehicles in television history and deservedly so: it’s cool. But I have so many questions. Where do they keep their clothes? Their shampoo? This is basically their home, right? And perhaps most importantly: They’re wanted war criminals. Every small town or foreign country they disrupt has a bad guy or crooked cop that wants revenge. So, why do they keep traveling in a vehicle that is immediately identifiable? Hubris? Stupidity? Make it make sense. Myc: I want to make it make sense. But I’m not sure I can. In the pilot episode, the narrative briefly addresses the idea that the guys settle into life in L.A. and work like “normal” people, occasionally augmenting their salary thorough mercenary work (all though they’re sort of moral mercenaries). “Mexican Slayride” suggested that the team members have some life outside of fighting the bad guy-de-jour. Hannibal is an aspiring actor, but he can only play movie monsters (because obviously he’s a wanted war criminal, so he can’t have his face appear in a film), so he has a “job.” In the first scene with the team, Face tells Hannibal that Col. Lynch is on their trail, and that he had just been to B.A.’s place, so I guess they have apartments? I guess they have sundries and weapons caches around L.A., or the world. But I certainly wouldn’t fault anyone for assuming that they’re living out of the van the entire time; that really makes much more sense from what we’ve seen so far. As for the van: it’s certainly distinctive. The closest we get to an answer in an episode we’ve watched actually comes from “A Nice Place to Visit,” and that is because the van belongs to B.A. When the van gets vandalized, Baracus rants about what’s happened to his van. I think that’s probably an important distinction. He could’ve said our van. So here’s how I’m going to make them traveling around in such an identifiable van make sense: If you had an elite team of mercenaries that included B.A. Baracus and he wanted to use his van as the team’s primary vehicle, would you tell him no? Cory: I appreciate that we’ve spent more time seriously analyzing the logic behind the team’s vehicle choice than we have just about anything else. I guess I buy your assessment, especially the part about it B.A.’s ownership. His rage over the tires made me smile. Definitely Mr. T’s best work thus far. And also: his clothes in these episodes. He wore what looks like a full-body red longjohn, with overalls on top. It looked hot out. I can’t even imagine that outfit. So, “A Nice Place to Visit.” The A-Team rolls into a small town–because that’s almost always what they do–but this time, it’s not to cause any trouble or save anyone. They just want to attend the funeral of a fallen comrade from Vietnam. But then, shockingly, trouble gets a-started. No one is allowed to attend the funeral and the town hillbillies (including a young M.C. Gainey) harass the team in attempt to rile them up and start a fight. Face tries to keep his cool, but eventually, he cannot anymore. After the funeral, which actually produced a little bit of honest emotion,* the finale turned into a more familiar version of the show we’ve watched over four hours now. *The funeral did produce that emotion, but it also served as a real example of the SNL “Bill Brasky” skit. The camera panned down the team as they described silly, overwrought Vietnam flashback memories about how the dead man had saved them. I was waiting for B.A. to have one tear in his eye. That was pretty great. How’d you feel about this episode’s plot? Better than “Children of Jamestown? Worse? Myc: This is the strongest story we have seen from the show. The guys are obviously not on a mission, and were just trying to honor a friend, but they found trouble nevertheless. And the story, while still a little hokey, made sense. I found it interesting how they try to avoid confrontation. We expect the A-Team to be morally-centered. Yet in this episode, the team allows terrible things to continue to happen so they can stay out of trouble. It is not until they’re directly affected by the Watkins clan that they decide to truly intervene in the town’s crooked power dynamics. Cory: Yeah, it’s an interesting choice. They don’t try to start conflict at first, but in doing so, they allow the harassment of other townspeople to continue. That reflects how important their friend is, but I guess their desire to only act when ABSOLUTELY necessary. It’s interesting thinking about the show as some American interventionist/manifest destiny-type story where these American guys, framed for bad behavior they didn’t commit, still go around saving the hopeless. In doing so, they show off their American brawn, ingenuity, and more. Yet, they also tend to truly help in dire situations. Maybe I’m reading too much into this (okay, I’m definitely reading too much into this), but that’s certainly a way to think about the show on a different plane. Speaking of that, this is now in some ways a themed discussion about television masculinity, so how do think these second pair of episodes portray or reflect it? To me, it seems like these episodes dialed that AMERICAN MEN stuff back just a bit; maybe that was something that the show modulated over the first season. The finale is a somewhat somber hour and it’s really more about the dead guy’s masculinity and patriotism than anything else, but this is probably something we should talk about before moving on to Magnum, P.I. next week. Myc: I completely agree. The pilot is a weird celebration of hyper-patriotic American masculinity. 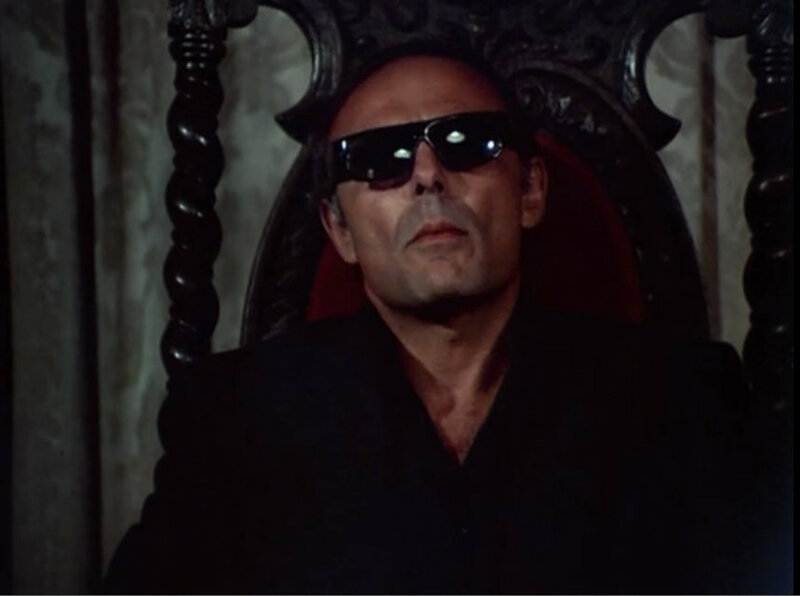 It’s interesting to note that “Slayride” took place in Mexico and the villains were Mexican, however the last two episodes are set in America and yet continue to deal with dynamics of unofficial power. The masculinity is dialed down a bit, but it is still present, just in a different context. In both “Jamestown” and “A Nice Place to Visit,” the villains operate outside of official systems and take power from ordinary citizens. In some ways we could argue that this is a critique of that passivity of American masculinity that could be viewed to exist in the cultural zeitgeist at the time. When we talked last week, I mentioned stereotypes about the Mexican villagers, and how they we’re unable to act as agents in their own lives until the A-Team shows up and we see the same thing in both of these episodes. The cult and the Watkins clan rob the ordinary man (and I think that it is important that it is men who are actually robbed of their power) of his ability to take action. The A-Team rides into town and reestablishes the masculine order by allowing the (male) people to act on their own behalf. The show is more subtle about it in these two episodes (though that’s not saying much), but the primary ideals are still there. The A-Team was probably important in expanding the cultural dialogue about the re-masculinization of the American male in a post-Vietnam era (shout out to Susan Jeffords here). It feels that way to me, but I feel even better with that qualifier remake present as well. It’s interesting that in the later episodes we watched essentially re-situate patriarchal values in a traditional mode through tertiary characters (most notably father/daughter pairings). We could probably argue that gender, particularly in a normalized sense, is the overarching—even defining—social relation of the show, and that it really only exists to re-establish, both intra- and extra-diegetically, a traditional gender dynamic. I think this is probably one of the important themes in the 1980s that we’ll probably be talking about as we move through these various series.